This information is a composite of information I gleaned on the web. Is it original? It’s about as original as the suit I bought! As I mentioned before, almost all of the suits I found for sale locally were made in China. What I’ve since learned is that many suit makers have moved assembly operations to Asia because of the weak dollar and high import taxes from Italy. "Made in Italy" on the label doesn’t guarantee quality, and it doesn’t even guarantee that it was made in Italy! There are premium suits and poor suits coming out of Italy, just like China, and today it isn't so much where it is assembled but how it is assembled, what fabric are used and by what standards. If the suit says "Designed in Italy" or simply "Milan Italy" it is not assembled in Italy. (See photo of my Chinese suit) Again, this does not necessary mean it is poor quality, it‘s just that it was made outside of Italy. 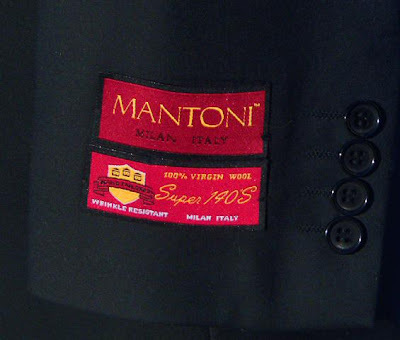 An Italian assembled suit will almost always have a "Made in Italy" tag. If you are hung-up on the country of origin, just ask the seller. If a seller is advertising hand basted canvas fronts on his suit ask him what this means. Most likely they have copied it from a web site and have no idea what it means. Hand basting is the Old School way of assembling suits by sewing by hand. It is superior in the longevity of a suit but most suit are now assembled by fusing with glue. That’s right, they use a hot-melt glue to “sew” suits today. It turns out that even the big boys like Armani and Zegna fuse some parts on their suits, so this again isn’t necessarily a sign of poor quality. There are only a few left like Oxxford, Canali, Baroni that still use canvas fronts. If the suit does not have a label in the pocket that explains the fabric composition, there is a good chance you have received a Polyester suit, despite any other visible tags that may say “Wool“ or “100% Silk“. This is very common with some sellers since the blend comprises a fabric that is almost indistinguishable from a high quality wool or silk. The hard way to find out is to iron the suit. If it melts you have been taken. If it smells like chemicals instead of a sheep that is also an indication that it is not wool or is a wool blend. Again, if it matters to you, ask the question. Remember that just like you, eBay sellers jealously guard their feedback, and the last thing they want is for someone to leave a comment that says “You ripped me off! The photo showed a tag that said “Milan Italy”, yet the tag in the pocket said Made in China!” Again, these tags are something that I doubt the guys and gals in China can even read; but what they are required to do is to disclose the fabric content and country of origin inside the coat pocket, so ask the seller about this detail BEFORE you buy. in buying suit online you need to consider the quality of the product,like Italian Suits from suitusa.com they give you more quality branded products.